By now the word is out that I’m starting a personal chef service this spring! With an emphasis on vegetarian, vegan and special diets (gluten-free, low salt, etc. ), I hope to bring fresh, delicious and healthy(er) foods to busy families (or singles) who are tired of takeout and fast food or are looking for a change. The name of the new biz is Fresh Chef Detroit and prices and details will be laid out in the coming weeks. Chris over at Tyrus Design is working on my new Web site at this very moment, as well as business cards and postcards. My good friend Grace designed my logo (which I looove) and another great friend, Monica, spent a recent Saturday photographing me so I actually look like someone you would trust in your home, cooking for your family (and not stealing your good china). The phone man will be here to install my business line within the hour and I’m set to take off for my week at the Culinary Business Academy in less than TWO WEEKS (yikes!). I’ve also been accepted to have a booth at this year’s VegFest, an amazing vegetarian/vegan expo hosted by VegMichigan — a great veg organization for which I served as volunteer editor until recently (when I passed the torch to focus on Fresh Chef). It looks like they already put a link to my site on their Web site so I better get it done! Thanks to everyone who has wished me luck and spread the word. I’ll continue posting updates on the Fresh Chef Facebook page and will hopefully be up and running soon! I continued my quest to find and create delicious, meat-free comfort food this weekend with a recipe out of my latest issue of Vegetarian Times (which is packed this month with all kinds of awesomeness). I had only glanced at the recipe when I went to the grocery store, and, fortunately, I already had or bought almost all the ingredients and was able to pull it off. My squeeze loved it and so did I. 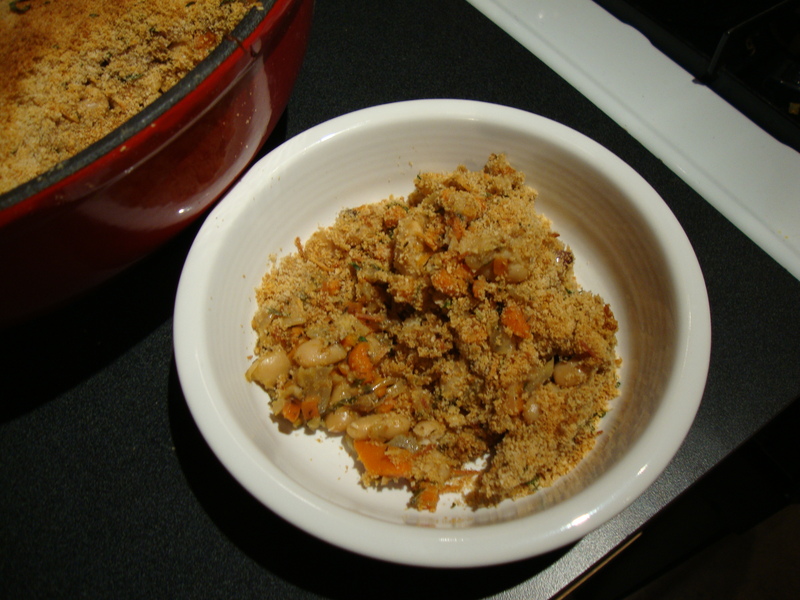 Next time, I think I’ll pop some bread in the food processor to make chunkier bread crumbs for the top, as the finer, store-bought ones were a little…sandy, for lack of a better term. But make no mistake — this is serious comfort food at its finest. This will feed five or six people easily, or it would freeze really well to eat some other time. 1. 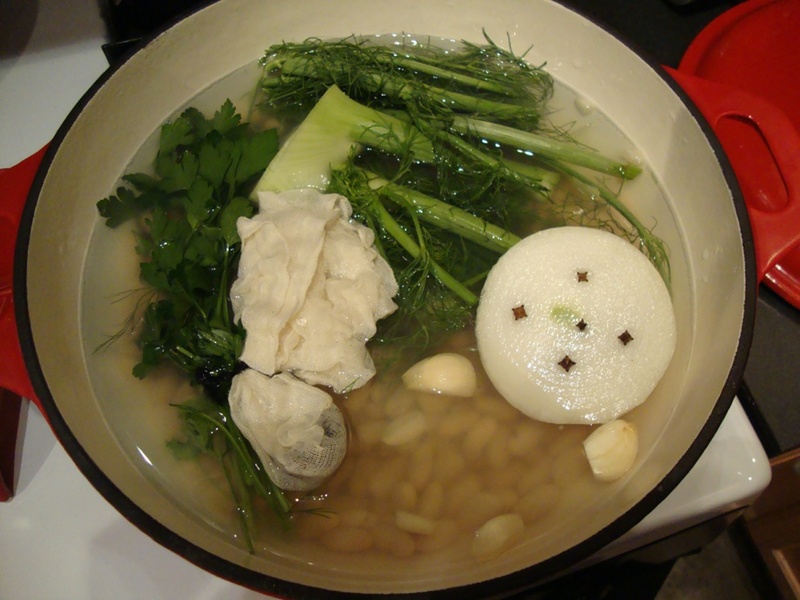 Soak beans in large bowl of cold water overnight and drain. Using canned beans, I drained in a strainer, but tried not to rinse them too well, so they wouldn’t be rinsed clean. 2. Put beans in a 6 quart Dutch oven, and add enough water to cover by about 2 inches. 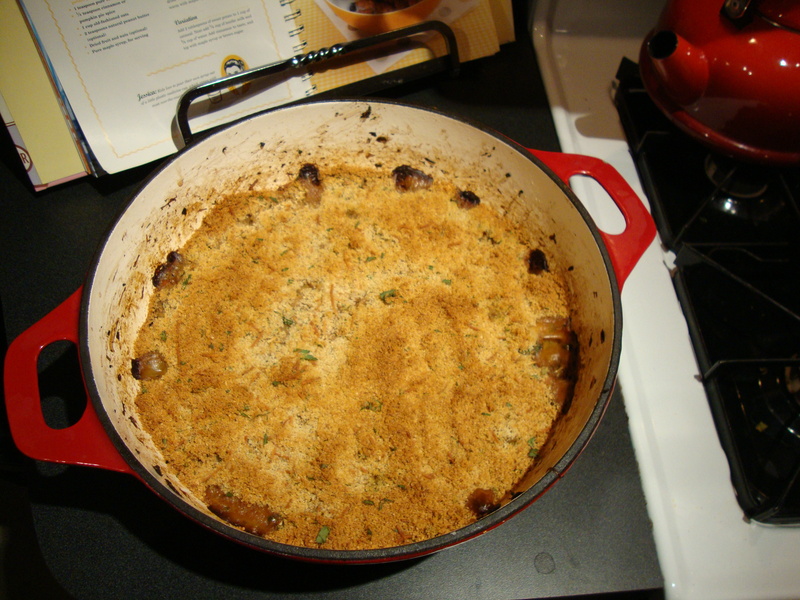 • Tie thyme and parsley sprigs together and add to pot. In my case, I tied the dried thyme up in cheesecloth and tied the parsley sprigs to it. • Fennel fronds and stalks, removed from bulb. This required me to cut some of them to fit. • Pierce onion half with cloves. Because the onion stuck out of the liquid, I ended up putting the clove side face down. • Halve six of the garlic cloves. It’s OK to leave the peel on. 4. Partially cover and bring to a boil. Turn oven on, to preheat to 400. 5. Uncover, reduce heat to medium low and simmer 35 to 40 minutes, or until beans are just tender (not an issue if you use canned — they’re already tender. BUT they don’t soak up deliciousness as much as dried beans would). 6. Drain beans, reserving cooking liquid. Discard herb bundles, onion, and fennel fronds. Here the directions said to wipe out the dutch oven… but I didn’t. 7. Heat 2 Tbsp. oil in Dutch oven over medium-high heat. Add carrots and diced fennel and season with salt a bit. Cover and cook 10 minutes, or until beginning to brown, stirring frequently. 8. Add diced onion, add more salt if you like (I didn’t) and cook, covered, 6 to 8 minutes, or until onion is soft and bottom of pan is browning, stirring occasionally. 9. Add minced garlic and cook one minute, or until fragrant, and remove from heat. 10. Stir in vinegar and deglaze the pan (use it to scrape up all the garbage stuck to the bottom of the pan). 11. Add beans, chopped thyme, 2 Tbsp. chopped parsley, 1/2 c. cheese or cheese substitute and 1 1/2 to 2 c. bean liquid, and stir well to combine. The directions say the liquid should come up to 1 1/2 to 2 inches below top of beans, but I think I’ll put in more next time. I actually thought this direction was a mistake at first, but can’t find anything to back that up. I think more liquid would have bubbled up through the bread crumbs a bit, making the top crunchier and less “sandy” as it was. 13. Spread breadcrumb mixture over the top of the bean mixture and bake, uncovered, 40 to 45 minutes, or until top is browned and juices have bubbled down below the surface (see? doesn’t that make it sound like the liquid was supposed to be ABOVE the beans to begin with? ), leaving brown rim around edge of crust. Cool at least 20 minutes before diving in so beans can absorb a little more deliciousness. According to VT, each 1-cup serving has only 285 calories, 17 g protein, 11 g of fiber, 5 g of fat (1 g sat fat), 43 g carbs and 150 mg sodium. Pretty good stats for a delicious and filling meal! Chilaquiles. Ever heard of them? I hadn’t until I saw someone make some on The Food Network a few years ago. Then my friend Tara did a guest post here on her version in 2008, but I never made them. This week I came across a recipe in a magazine, but didn’t really read it… So I decided to make some anyway today — or at least something that resembles them! 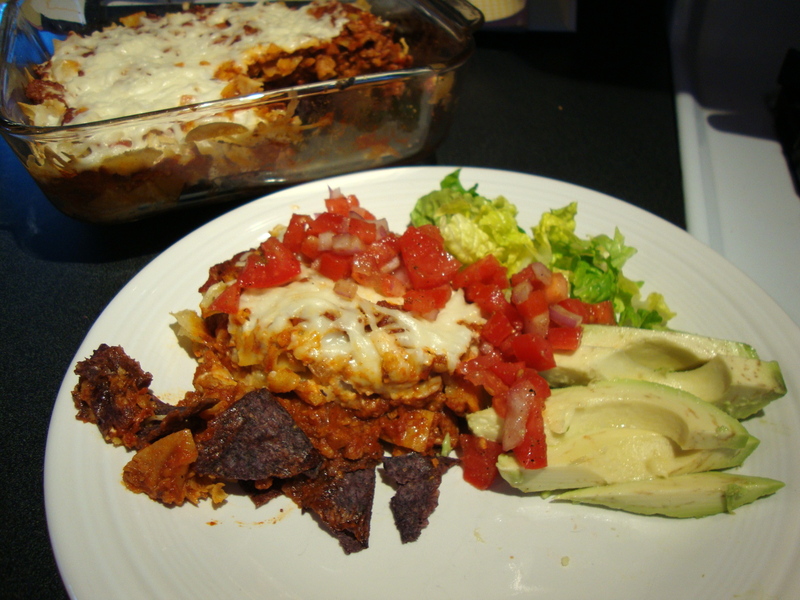 To my knowledge, chilaquiles involve chips, sauciness and cheese, you bake it and dig in. It wasn’t until after I popped mine in the oven that I poked around online to discover that calling what I made chilaquiles might be a bit of a stretch, but I’m going to call it that anyway! Here’s what I did — and keep in mind I was working with things I already had on hand (like frying some tortillas, because I was lacking the amount of chips I would use). So, feel free to substitute just about anything for anything. 🙂 I think next time I might add some veggies to the sauce too. 1. Cut soy chorizo out of plastic casing and cook in a bit of olive oil with garlic and onion. 2. When it starts to stick to the pan and the onions are soft, add can of crushed tomatoes. I started with half of the can, but it was really thick and I wanted it to be saucier, so I tossed in the whole thing. It was perfect. 3. I added spices to taste — a little salt and pepper, about 1 tsp. cumin (maybe a bit more) and several dashes each of nutmeg and cayenne pepper. 4. I let this cook for a bit while I heated the oven to 400 degrees. Meanwhile, I chopped up several corn tortillas and quickly fried them in some oil. They were just semi crispy, but that worked for me. I think this recipe would have worked just the same if they had not been fried or if I had made a layer of whole tortillas. 5. 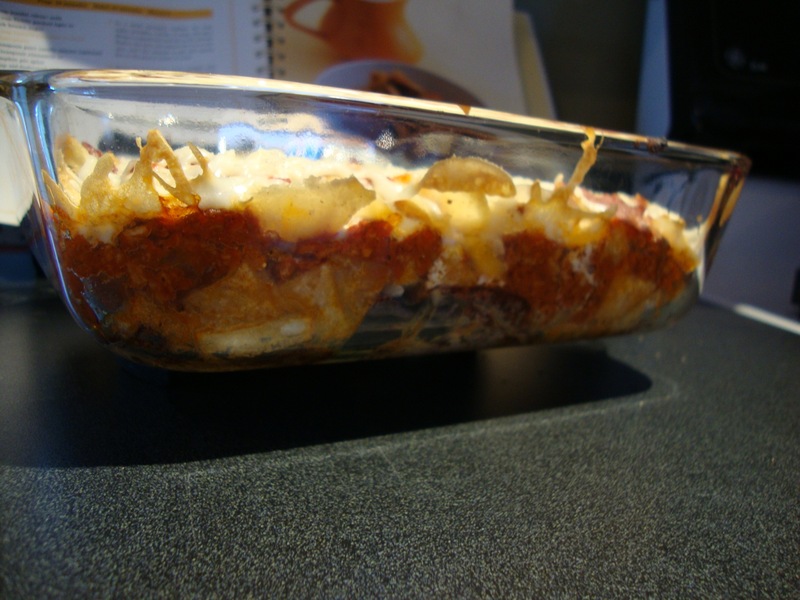 Using an 8×8 glass dish, I put all my blue corn tortillas chips in the bottom, put a thick layer of chorizo sauce, then a layer of the fried tortilla pieces, a thin layer of the sauce and topped with grated cheese. If you’re not going vegan, here’s where you can water down some sour cream and pour it over the top too (according to those recipes I discovered after the fact). 6. 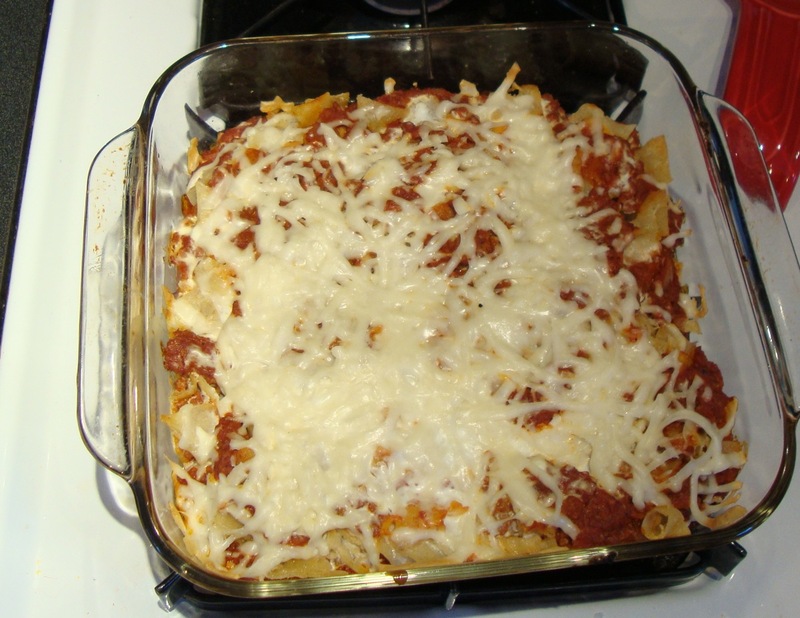 I let it bake for about 20 minutes or so, until the cheese looked sufficiently melty. 7. While it was baking I made a bit of a salsa fresca — chopping up a bit more red onion and fresh tomatoes, adding a little salt, pepper and cumin to the mixture. I topped my portion with some of the salsa fresca and served it with chopped romaine and sliced avocado. You could top with sour cream or Tofutti sour cream to serve too. This is one of the most flavorful things I have come up with in a long time! I really loved it and would definitely make it for a brunch for 5-6 people. It was just a little bit spicy, but leaving out the cayenne would help with that if you don’t do spice. I’m happy to have discovered this vegan chorizo too — I think it would be excellent in chili or would be a perfect taco filling as is. Since my squeeze’s new favorite oatmeal involves pumpkin, I was sure to scoop up several cans during post-Thanksgiving grocery store sales. 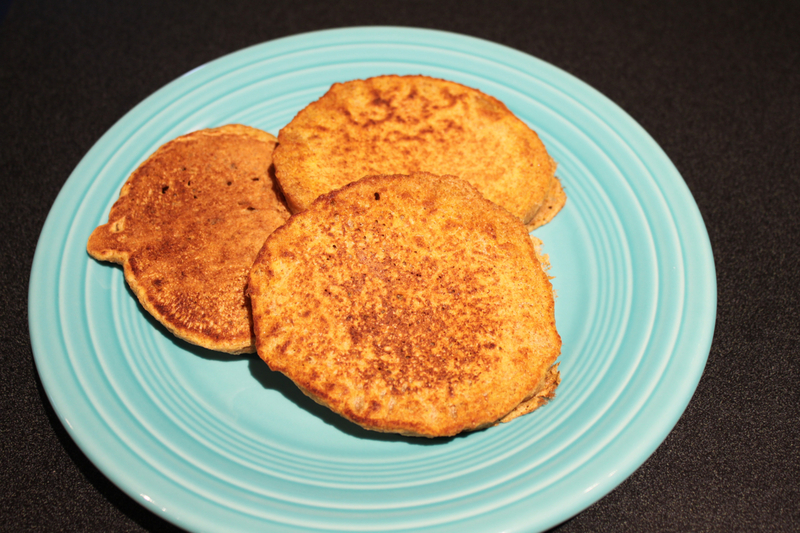 But the other morning I decided to do something more with it and quickly googled a recipe for vegan pumpkin pancakes. I ended up adding a little more water than is recommended to make slightly thinner cakes and added 1-2 Tbsp. of sugar since so many of the reviews said they needed it. I was going to go with molasses, but apparently I’m out! I like that, for this recipe, you don’t have to come up with an actual egg replacer too. This recipe made at least 20 pancakes — it would be a perfect recipe to use if you’re having a bunch of people over for brunch. They were easy and filling, not too heavy and not too sweet or pumpkiny. I had about 10 leftover (after D tasted mine, he had to have Breakfast, Part 2) and I wrapped them up in foil packets of two, so we could just grab one, unfold it and nuke them for the pup before school now and again. She loved them and had no idea she was actually getting some nutrients in her pancakes! I’ll definitely make these again. 1. Combine almond milk and vinegar and set aside for about 5 minutes, allowing it to curdle. This is like using buttermilk — and the same thing I do for banana muffins. 2. Stir together pumpkin, spices, water and soymilk in mixing bowl. Add in remaining ingredients until just moist and stop. Let it sit for a bout 5 minutes, then stir again and let it rest a few more minutes before cooking. 3. Cook on a griddle on medium heat — I found that to work the best for the most even cooking. 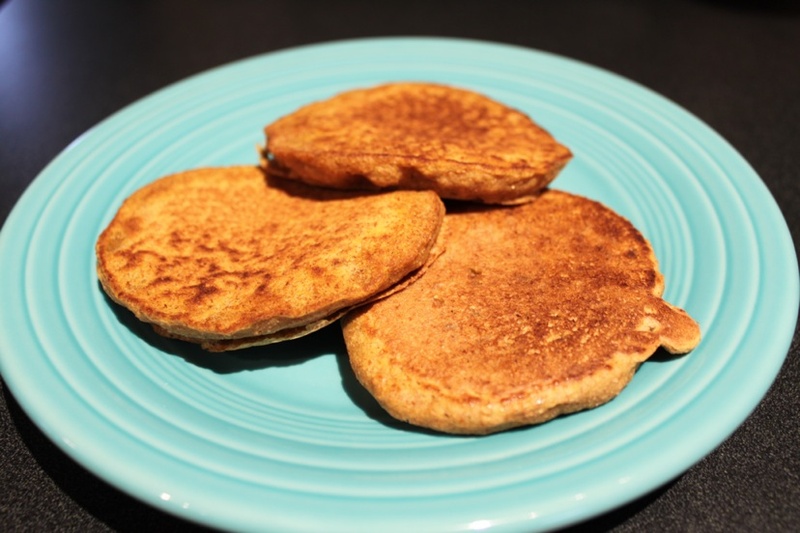 They are delicious topped with Earth Balance Buttery Spread and whatever else you normally enjoy on pancakes! 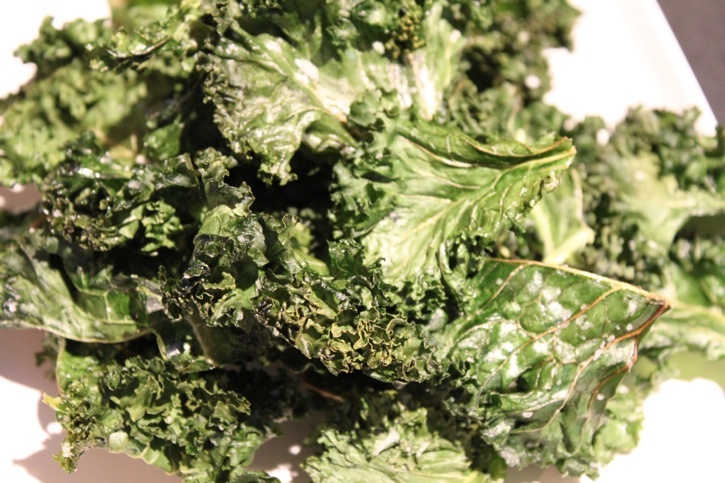 The first time I heard of kale chips, I thought something like, “Wait — what? Who? How? 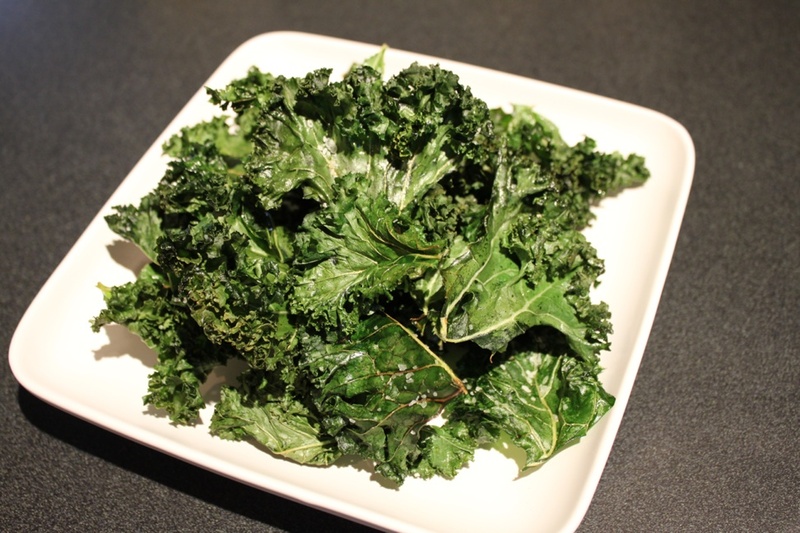 Huh?” Some months later, I decided I needed kale chips in my life. They were a big hit at our pre-Christmas holiday party and I decided I should just buy kale and make them all the time. A true testament to the deliciousness of a kale chip was the fact that I scraped myself off the couch on New Year’s Day to make them. After a three-day bender (well, girls night out followed by getting engaged and celebrating too much followed by NYE) I knew I needed some vitamins and nutrients vs. the grease (like real chips) my brain said I wanted. It totally worked. I got the goodness my body needed and I got the crunch my bad habits needed. Skeptical? Give it a shot. You’ll spend a couple of bucks on a head of kale and you’ll be surprised. 1. Wash and let dry one head of kale. 2. Cut leaves from thick stem and cut or tear into bite/chip-sized pieces, placing them in a good-sized bowl. 3. Drizzle in olive oil. I usually drizzle about half of it, then toss kale and drizzle the rest. You’ll think 1 Tbsp. isn’t enough for all that kale, but you’ll be surprised — it totally is. 4. Sprinkle with sea salt or another coarse salt (pink Hawaiian sea salt I got as a baby shower favor recently was delicious!). You can do this once they are on baking sheets or while tossing. 5. Spread on 1-2 baking sheets (depending on how much you have) in a single layer, but don’t sweat it if there’s a little overlap. They shrink a bit while baking. 6. Bake at 325 or so for 20-25 minutes, or until the edges of the kale begin to brown and the pieces are crispy.